AMD announced this morning, the first ever quad-core processor for less than $100 Suggested System Builder Price (SSBP). This is a significant announcement as quad-core processor prices have really fallen over the years and are now relatively affordable no matter what country you reside. Without further ado let's take a look at the new processors. AMD announced two AMD Athlon II X4 processors this morning. The AMD Athlon II X4 620 processor is the industry��s first and only sub-$100 quad-core processor at this time as it is priced at $99. The other processor is the AMD Athlon II X4 630 processor, which costs $122 and has a multiplier increase that is good for a higher overall clock frequency. Both of these processors feature a 200MHz bus with a 2000MHz HT link and memory support for both DDR2 (up to 1,066 MT/s) and DDR3 (up to 1,333 MT/s). So, what is missing to make these processors so inexpensive? 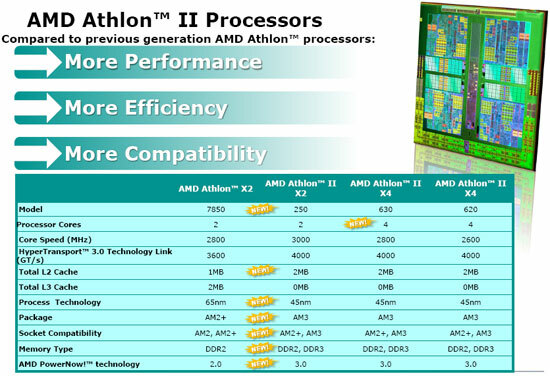 Well, it seems that AMD has done away with all of the L3 cache on the AMD Athlon II X2 series. They did this by doing a double sourcing method in order to get the cores. AMD sent us an e-mail confirming that they are building AMD Athlon II X4 processors that are based on both the new 'Propus' 169mm die and the older 'Deneb' 258mm die size. When an AMD Deneb core (Phenom II X4 processor) fails the L3 cache test the L3 cache is disabled, so it basically becomes an Athlon II X4 processor. This makes good business sense as a processor isn't being wasted due to a problem with the L3 cache. Instead, the fallout just gets stamped with a part number; in this case it will become an Athlon II. It will be interesting to see if consumers will be able unlock the L3 cache on any Deneb based AMD Athlon II X4 processors by simply enabling Advanced Clock Calibration (ACC). Companies like AsRock have been marketing how their boards unlock 'hidden' features like this, so time will tell. The other method uses a new die called Propus, which is designed from the ground up as an Athlon II X4 processor. The smaller die of Propus means that it will be less expensive to manufacture and allows AMD to hit aggressive price points for quad core processors like we are seeing today as they have fallen below the $100 mark for the first time ever. They are built with the same great architecture as the Phenom II X4. 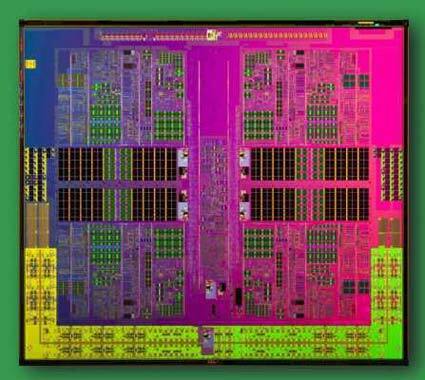 That means they are built by GLOBALFOUNDARIES at Fab 1 in Dresden, Germany using the 45nm DSL SOI (silicon-on-insulator) process that all the other higher-end Phenom II processors use. The first of the new processors that we will be looking at today will be the AMD Athlon II X4 620, which can be purchased for a cool $99.99. The processor runs between 0.925V-1.425v for normal operation and has an overall clock frequency of 2.6GHz. The processor is multiplier locked with a 13x multiplier as it is NOT a Black Edition processor. If you want to overclock this processor you'll have to do that by increasing the 200MHz base clock. The CPU's HT link is set to 2000MHz and features just the L2 cache level, which is 512KB of L2 per core. Featuring a 95W TDP means that the Athlon II X4 620 has the same power rating as a triple-core Phenom II processor. 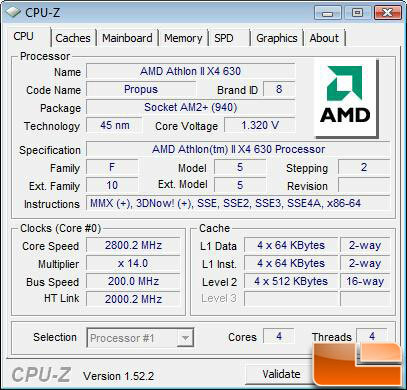 Taking a closer look at the AMD Athlon II X4 630 processor with CPU-Z 1.52.2 you can see that this is a quad-core processor based off the 'Propus' core again, but the clock frequency is 2.8GHz. The processor is multiplier locked just like the Athlon II X4 620 processor, but it has a higher 14x multiplier. All the other features between the two processors are the same, so it, too, is a multiplier locked processor. The higher multiplier should be of interest to overclockers as a result. For an extra $30 the multiplier jump alone should be enough to justify the price premium. Speaking of price, let's take a look at the Phenom II and Athlon II processor pricing. The AMD Phenom II and Athlon II product stack is strong as usual with prices starting out at just $60 for the AMD Athlon II X2 240 and rising up to $245 for the Phenom II X4 965 BE. The AMD Athlon II X4 630 is nearly twice the price of the AMD Athlon II X2 240 and rightly so as it has double the cores. When an Athlon II X4 processor is combined with a sub-$100 motherboard featuring the AMD 785G chipset, you can clearly see that AMD has a great platform at a very solid price point for Windows 7 when it launches next month. It seems AMD has their processors priced right, so let's get to testing to see how these new budget friendly processors do against a few dozen others.